Be prepared for the latest game release with a desktop painstakingly engineered to transform your gaming experience into something truly unforgettable. Built from the ground up to meet every conceivable requirement for perfecting your games, the HP OMEN X is the premier solution for serious gamers looking for one of the most customizable, efficient, and exceptional gaming devices available. Unlock your potential with access to the highest-quality graphics, storage, memory upgrades, and performance. 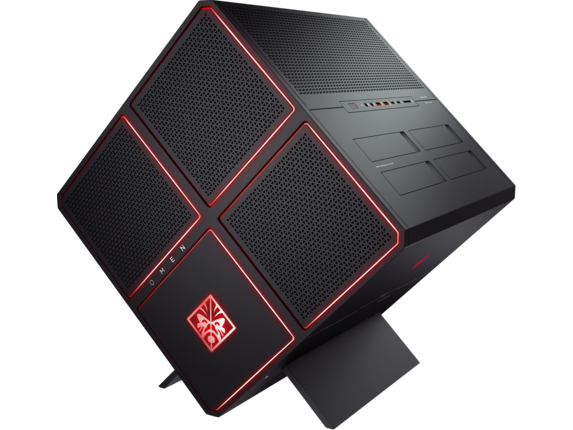 The HP OMEN X desktop looks just as amazing as it runs. Its black cubic chassis is highlighted by vivid red accent lighting that pulses with promise of superior performance. The inner chamber is designed as a repository for the unique combinations of customizations along with most industry standard hardware. It’s the perfect foundation to build on to keep up with the increasing requirements of AAA games for years to come. Set your gaming station apart from all others with a tower that exudes quality and unlimited potential with a single look. Say goodbye to the days navigating over an endless sea of cables or bending into uncomfortable angles to install new parts. Resting at a 45-degree angle, the HP OMEN X blends style with access and convenience, optimizing your ability to install additional upgrades and accessories. Remove or add components directly from the exterior without turning a single screw. Avoid the eyesore of a heap of intertwined, tangled cables cluttering your carefully curated gaming area. With a clever design that hides the PSU and its cables behind the motherboard, you can keep your gaming rig pristine and unencumbered. Untamable performance power comes with some heavy-duty heat, so you need a machine with a cooling system equipped for even the most intense gaming sessions and hardware demands. The HP OMEN X desktop features a cutting-edge cooling system tailored to keeping up with your most vigorous, demanding marathon sessions. Thanks to its precision-oriented angular, tri-chamber cooling design that evenly distributes and expels heat, you can rest assured that no matter how hard you push, the HP OMEN X will keep its cool. 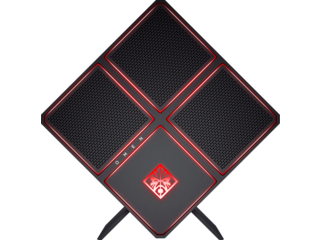 The HP OMEN X lets you discover what video games are truly capable of with an interwoven array of some of the most advanced hardware available. By capitalizing on the power of the Intel® Core™ i X-Series processors, you can count on the gold standard of performance capacity to ensure that your games run smoothly, even at maximum settings. Blur the barriers between real and digital to see your games in their purest form. They’ll run with unparalleled fidelity with the options of dual NVIDIA® GeForce® GTX 1080 Ti or dual AMD Radeon R9 Fury X graphics cards. And don’t let the increasingly massive file sizes of current AAA trouble you. The HP OMEN X features four separate storage bays, each capable of up to 3TB for a whopping 12TB of potential storage so you can keep expanding your games, DLC, and update files. An additional option of a Samsung PM961 M.2 SSD with 512GB lets you increase your memory capacity even further. Even the most content-hungry gamers will be hard pressed to fill up the seemingly endless hard-drive space. Bridge the gap between you and your favorite games with virtual reality for deeper, totally immersive gameplay. Right out of the box, the HP OMEN X comes equipped with the latest innovations and specs that provide you with the most realistic and responsive VR experiences. Fighting dragons, saving the world, and orbiting a lunar colony in a space-cruiser has never felt more lifelike. And as these games get bigger and better, you’ll love that your HP OMEN X can keep right up with them. 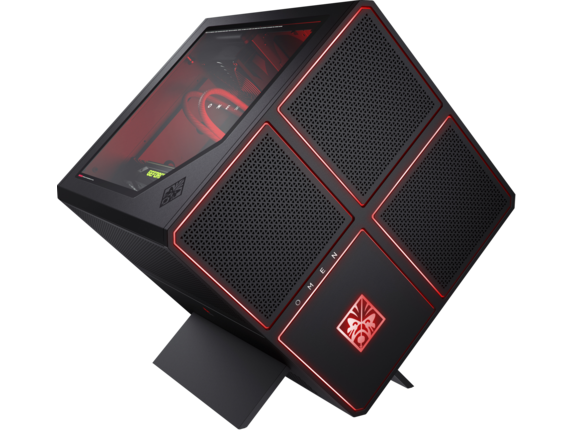 For anyone who prioritizes customization down to the last detail, the HP OMEN X case allows you to take the chassis of the desktop and make it entirely your own. You can create your dream gaming system from the ground up and then enjoy your games exactly how you want. Looking for something that combines the punch of a gaming desktop with the portability of a laptop? 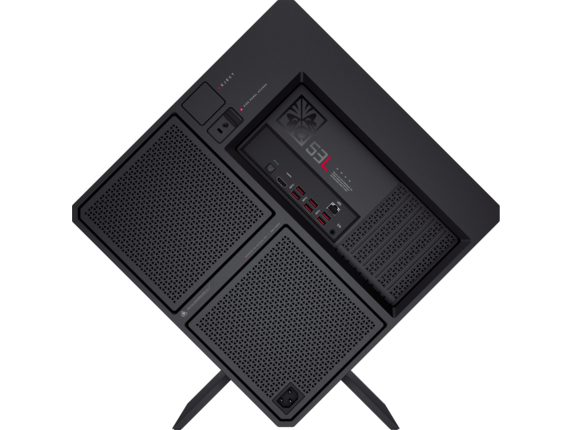 In addition to harnessing the power of many gaming desktops, the HP OMEN 15t and the HP OMEN 17t open up a whole new realm of possibilities for gaming on-the-go. With the processing might of an Intel® Core™ i7 processor, NVIDIA® GeForce™ GTX 1050 Ti graphics, and up to 1TB of HDD storage, you can count on an unrestrained gaming experience nearly anywhere. The limitations of laptop gaming have become a thing of the past with these machines. In addition to their customizations and upgrades, you get the tactile dream of a keyboard with features designed for precision controls. You can count on the HP OMEN X to ensure that you are getting the most heightened version of any gaming experience available. That goes for whether you’re climbing to the number-one spot in a battle royale, racing at breakneck speeds across an urban landscape, organizing your squad to bring home a victory, or luxuriating in a bright, colorful virtual world. Designed to maximize every facet of your gaming routine, from hardware upgrades to graphical output, this powerhouse of a desktop can change the way you play. It also provides you with a wealth of new possibilities for each new advance in gaming.